Easter. A time of chocolate, lots and lots of chocolate. It means two days off of work and a weekend of celebration. It’s also the first bank holiday of the year in the UK and the first big school holiday too, the capital is teeming with things to do. As always, the Melita Hotel is at the heart of it. 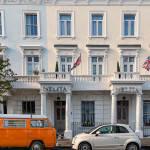 Where better a base than a beautiful, quiet, family run hotel that also just so happens to be practically on top of Victoria railway and underground station? The possibilities are endless! 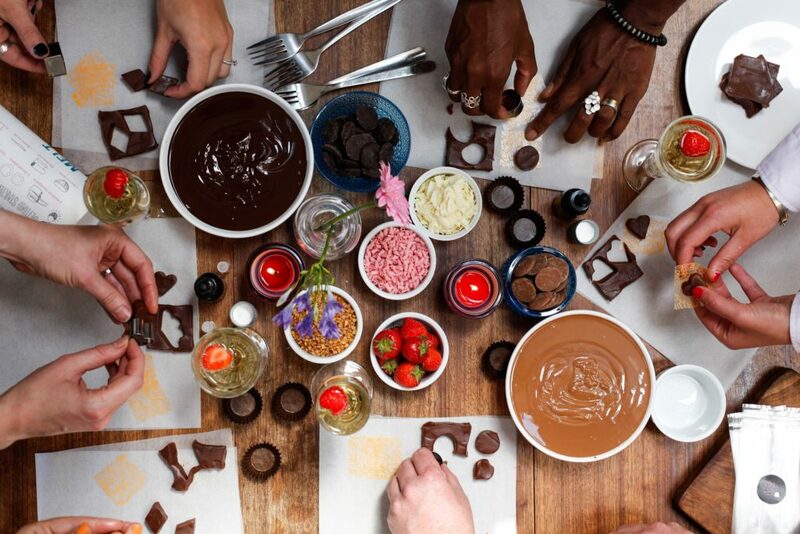 If you’re finding it difficult to think past the fifth word of this article then I guess we’d better tell you some of the places to visit to get the best chocolate in London! This can be found in Wardour St just a short walk away from Oxford Circus or Tottenham Court Road tube stations. The former is literally three minutes away from your Victoria base at the Melita Hotel. The man in the name used to work as a head pastry chef and has a handful of other outlets in London. All of the chocolate creations in the shop are handmade on site, in small batches using fresh ingredients. Believe it or not, there is such a thing as the International Chocolate Awards, and Paul was named Outstanding British Chocolatier in 2014. Also within a few minutes walk of Oxford Circus Tube, Choccywoccydoodah (home of the Choccywoccyrocky Road) is a chocolate shop, stroke, chocolate themed cafe. There’s a huge range of quality chocolate products on offer and the theme is art and design and one off sculptured fantasies (plus some rather naughty stuff). Pop in to this tiny little café for tea and a pastry and leave with a box of gorgeous truffles or a bespoke hamper. If you’re visiting over the Easter holidays there is also a wide range of chocolate eggs and Easter themed baskets to take your pick from. We’re especially intrigued by Tilly the Bunny’s Best Kept Secret Hamper! Best thing is, Sloane Square station is just a two minute journey from Victoria. Perfect place for a quick visit if you’re staying at the Melita. If the above statement means literally nothing to you, the chances are you’re not from round these parts, so let me explain. This is something that is particularly British. The British love baked beans. Correction – The British specifically love Heinz Baked Beans. Beanz Meanz Heinz is an infamous advertising slogan that is used to advertise said beans. That slogan is now 50 years old which is a reason to celebrate. Still confused? Don’t worry, you will not be alone! Even if you don’t fully understand the celebration, the pop up shop itself is located within the iconic Selfridges store, which is well worth a visit, beans or not. If your brow is set slightly higher than baked beans and their associated celebrities then this might be the exhibition for you. A world famous artist displaying his art at a world renowned venue, David Hockney is one of only a handful of people who you could genuinely call an ‘art celebrity’. This show isn’t a look back at his work, it’s a journey through his life’s work which doesn’t quite come to an end, at eighty years old he’s still current and still painting. 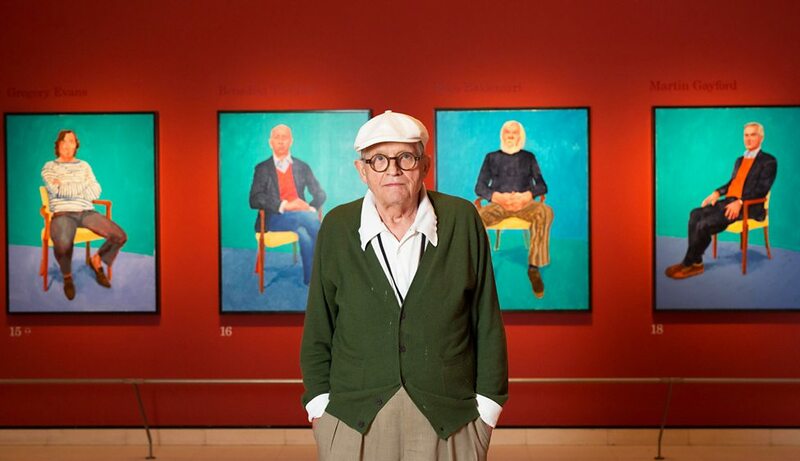 Hockney is a master of many crafts which you’ll appreciate as you wander from room to room. Landscapes as diverse as Yorkshire and California feature heavily, as do a fair few lovers. This exhibition runs through Easter until the end of May, Pimlico and Vauxhall tube stations are just a few minutes from the Melita Hotel. If you’ve got children with you on your trip to London and you dare to take them to the David Hockney exhibition, the chances are they’re giving you a hard time right now… You may need something to bring them back on side, especially if you’ve already exhausted the chocolate shops. Luckily, the Unicorn Theatre near London Bridge is putting on an absolute classic this Easter, The Velveteen Rabbit. Based on a timeless novel written in 1922 by Margery Williams, this is a genius production suitable for anyone aged four and over. A story about a boy and his toy rabbit that he can’t bear to be without, a special toy that is hoping itself it will one day become real. 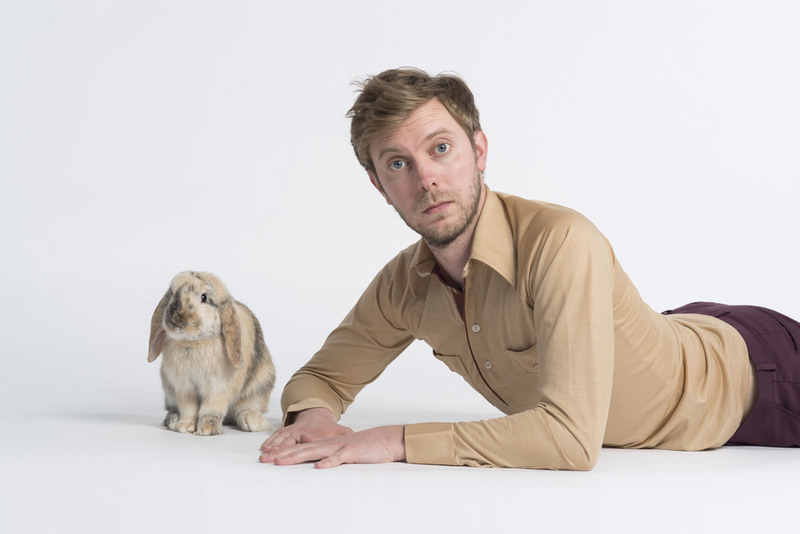 This is a must see this Easter, it’s about a rabbit, so why wouldn’t it be? If you’re feeling adventurous and prepared to venture outside of central London for a real treat then consider this. One of two surviving palaces owned by Henry VIII, a palace with both Tudor and Baroque styling which has been in existence since the 1500s. The last King to call it home was George II. Hampton Court Palace can be reached by rail from Victoria station in only 45 minutes. The palace itself is host to a large number of pieces from the royal collection and the grounds also boast a famous maze and the largest grapevine in the world. That’s all well and good, but what about the chocolate?! Well, from 1-17 April the palace is home to the Lindt Gold Bunny Hunt! 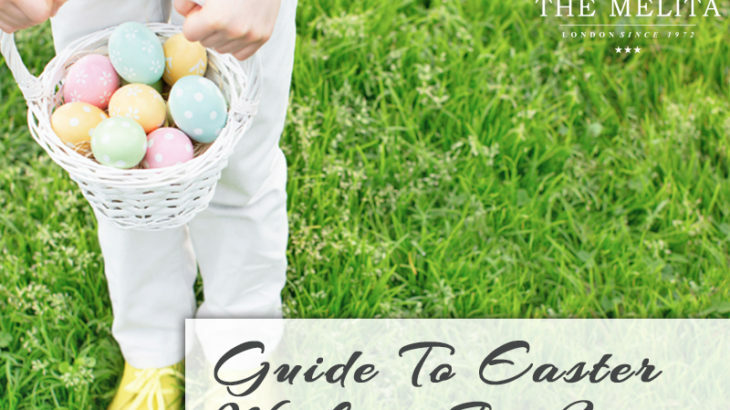 Follow the map around the gardens, finding all of the gold bunnies before claiming your real chocolate prize. After that, why not give yourself a much needed half hour break by showing your kids into the maze? Everything is included in the price of the entrance ticket. 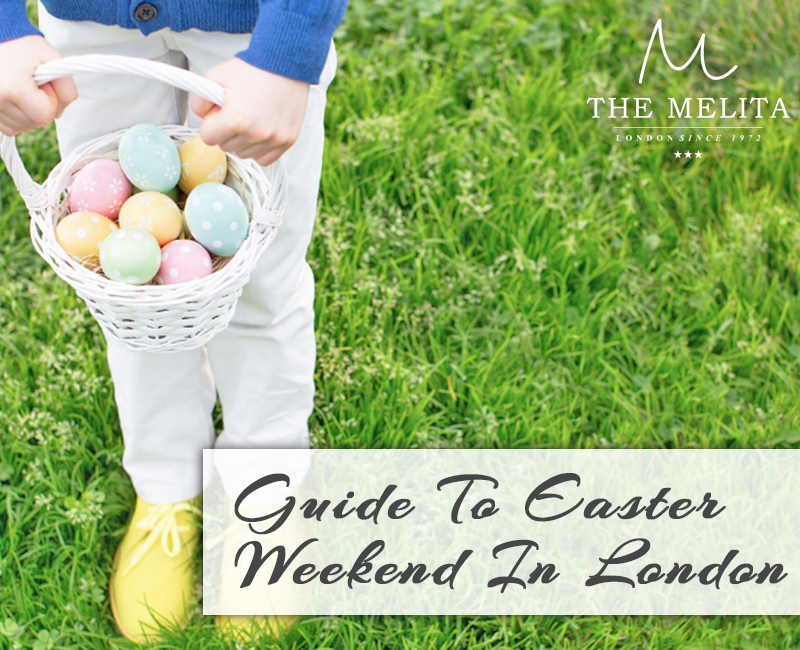 All of these activities and more are taking place in and around London over the Easter holidays. Make sure you stay at the Melita Hotel for easy access to everything you need for a break in a wonderful city that you won’t forget. When visiting London, the chances are you’ll do a lot of walking so bring some very comfy shoes. Whilst the underground system is the fastest way to get around, actually perambulating across the city is the very best way to ensure you see as much as possible. 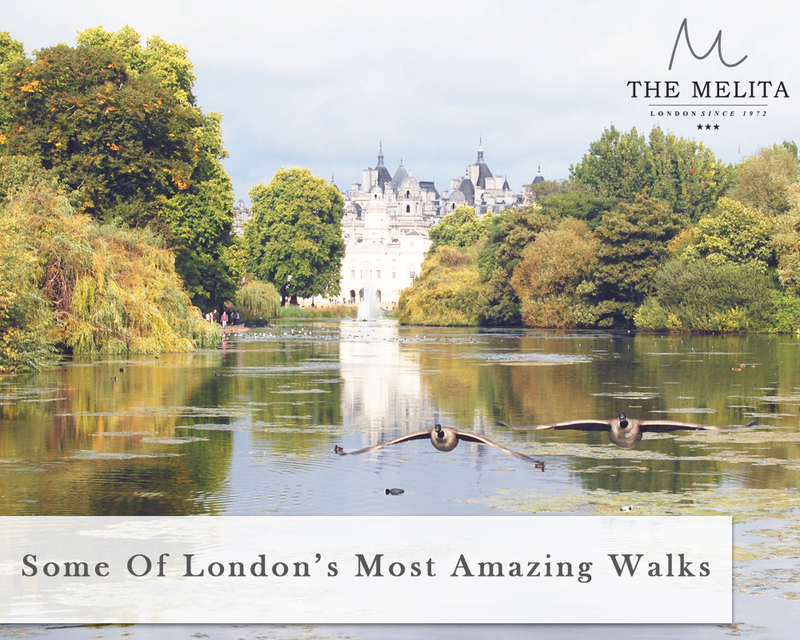 Luckily The Melita Hotel, as well as being a fantastic base for London public transport, being so close to Victoria Station as it is, is also a great hub for some of London’s best walks. Here’s a selection of some you can try. Now just to be clear, this walk is twenty-three miles long and we are in no way suggesting that you do all of it in one go! You’ll enjoy every step if you do though. 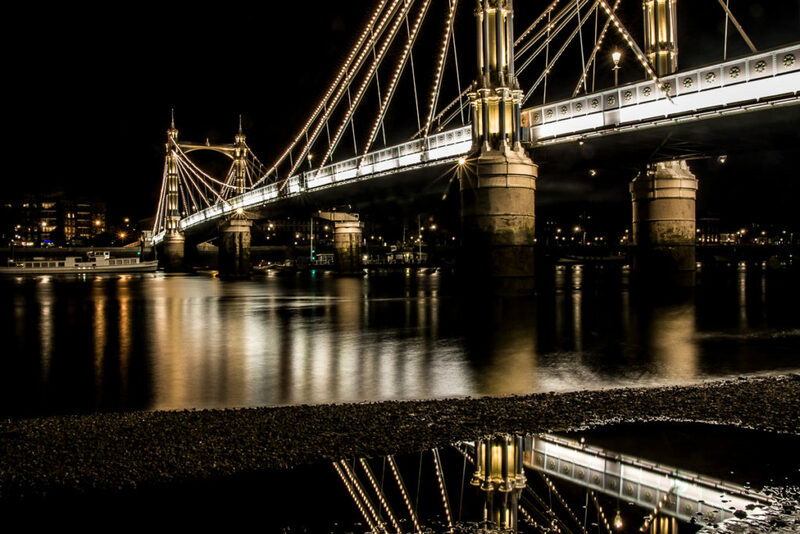 The Albert Bridge itself is just over a ten minute walk from The Melita Hotel and is worth a look in itself. It uniquely incorporates three different bridge designs. It was originally designed as a cable-stayed bridge in 1873, this was structurally unsound so elements of a suspension bridge were incorporated in 1884. In 1973 two concrete piers were added in the middle, transforming it into a simple beam bridge. Trust me, if you have a bridge enthusiast with you, they’ll love it! Once you’ve finished with the bridge and set off on your walk you’ll find it takes in some North Bank attractions that are well worth a peek. The botanical gardens at Kew, the Petersham Meadow view, Syon Park, before reaching the beautifully landscaped gardens at Hampton Court Palace. If you don’t fancy the full twenty-three miles, this one may well be worth breaking up into pieces. If you’re looking for a quiet walk then keep scrolling, because this isn’t it. 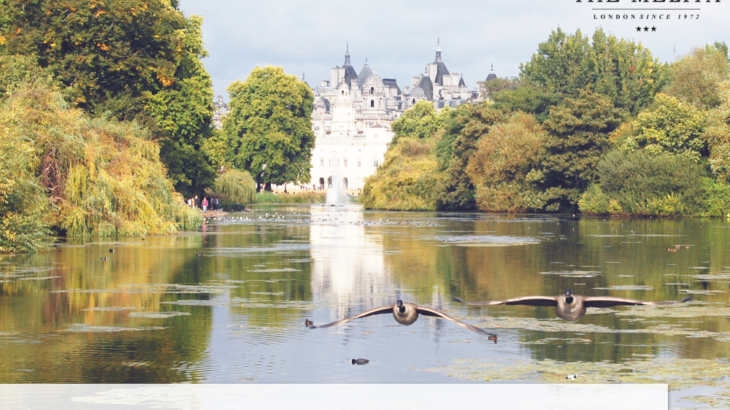 St James’s Park is one of the busiest of London’s parks, but it is within strolling distance of the Melita. The park is teeming with wildlife which, thanks to the constant throng of pedestrians, is completely comfortable with a human presence. If you’re patient, you can feed a squirrel right from your hand. There’s also the famous Pelicans to see here too, which have been a feature since a colony was gifted to Charles II in 1664. You can extend your walks to other London parks if you fancy being out for longer. Kensington Gardens, Green Park and Hyde Park are virtually all in a rather handy line. This is a great walk to get some amazing photos of some of London’s most prominent landmarks: Buckingham Palace, Horse Guards Parade, London Eye and The Shard are all set in picture perfect frames. We’ve had a walk along the North Bank, it would of course be rude to ignore the South Bank of the Thames. The South Bank walk is a very popular one as it crams so much into such a small space. 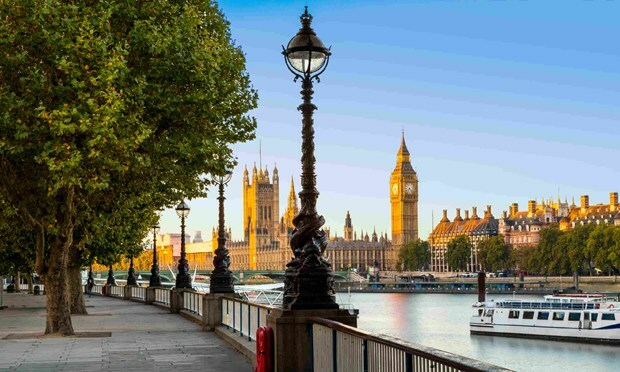 You may be walking along the South Bank but your focus will definitely be on the North as this is the best place to see some of London’s best features. The walk goes from Tate Modern to Jubilee Gardens and affords very special views of Big Ben and the Palace of Westminster as well as Tower Bridge. Victorian lamp-posts light your way, this is a walk that offers very different but equally memorable experiences depending whether you choose to take it day or night. 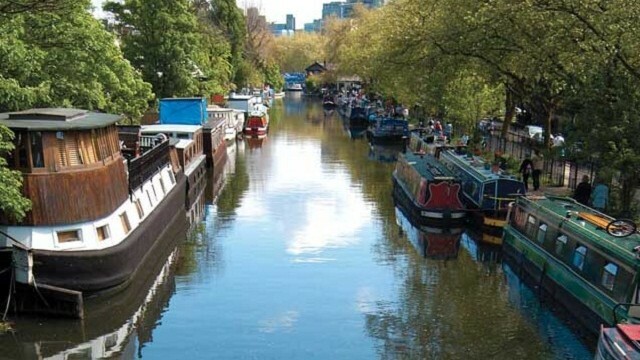 Walking from Little Venice to Camden along the Regent’s Canal is certainly one of the most picturesque walks in London. It’s a definite ‘get away from the hustle and bustle’ walk and if it’s a sunny day the only traffic you’ll see are the boats and barges moving slowly across the water beside you. You’ll feel like you’re in the British countryside as opposed to a major capital city. Feeling peckish? Camden is your perfect destination. There’s nothing like a dazzling array of street food to tempt you after a two mile walk. London has been a big deal since Roman times. Whereas London is now a sprawling 611 square miles of 21st century city, back in 200AD it was a little bit smaller and a little bit easier to define. That was because it was surrounded by a massive wall. The wall stretched around the original and ancient City of London and today there are still some surviving fragments. Starting at a piece located adjacent to the Tower of London, this walk will take you through the modern City of London, taking in plenty of surviving wall pieces as well as monuments and signs to commemorate where other significant pieces one stood. Samuel Pepys was a British politician and naval administrator, but made his name as one of the most famous London diarists of his time. Indeed, if it wasn’t for Pepys our knowledge on major events such as the Great Fire of London, the Great Plague of London and the Second Dutch War would be very limited. This is more of a ‘figure it out for yourself’ walk so be prepared to program your phones or step into your maps as you go along. Seething Lane is where Pepys lived and was buried, so this would be a good place to start the walk. Victoria station is just a few minutes walk from the Melita Hotel and Seething Lane is very close to Tower Hill Tube, which is a few minutes away on the District Line. From Seething Lane, take a walk over to the Tower of London. This is the spot from where Pepys watched and wrote about the Great Fire of London. From there, head to Pudding Lane and The Monument, which is where the fire started as well as being home to the Sir Christopher Wren built memorial to it. Walk past St Paul’s Cathedral to Fleet Street. This street used to be eponymous with British newspaper publishing but Samuel Pepys was also born here. A plaque in Salisbury Court remembers this fact. These are just a few examples of some of the walks that can be had around the city. There are walks by design but the Samuel Pepys Walk is a great example of a walk that can just be made up as you go along, taking in sights along the way that might not appear in any guidebook. The best thing about walking around London? Knowing you have a comfy bed in a quiet street waiting for you at the end of the day, at the Melita Hotel. It has things to see and things to do and it seems to want to tell you all about them, keeping nothing in reserve. It’s hard to imagine that a heaving, pulsing metropolis such as London could harbour any secrets, but it does. 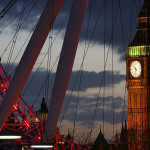 As well as being a thriving modern city London is also a historic one. Historic cities tend to have lots of nooks and crannies, hiding places and unknown treasures. Places where not everyone gets to venture. One of those hidden treasures is of course the Melita Hotel. On a quiet street in Pimlico that could never be described as heaving or pulsing, but is literally minutes away from where it is. The Melita is a well maintained, family run townhouse hotel which offers you a home away from home. Your own hidden gem from which you can uncover the other secrets of this capital city. As a city, London has an extraordinary number of parks and green spaces where you can relax and unwind in relative peace and quiet. They’re generally huge, beautiful green open spaces and they are certainly no secret. 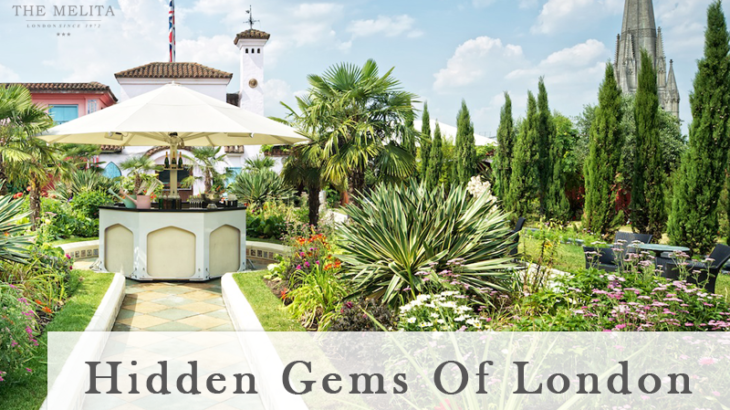 The Roof Gardens in Kensington however, is a little gem that isn’t so easy to find. Especially from the ground. Situated 100ft above the city, this really is an area where you can get away from it all. Originally opening above a department store in the 1930’s, this is 1.5 acres of astonishing landscape. The outdoor space consists of three themed gardens: Spanish Garden, Tudor Garden and English Woodland, each with its own unique style and feel. Within the English Woodland setting there is a pond where you can find several species of exotic ducks, as well as being a hangout for a group of Flamingos, naturally. This oasis is just minutes away from the Melita Hotel and is completely free to enter. There’s even a restaurant there so you can make a day of it. Imagine getting back from your trip to London and telling your friends all about it. You’ll get the usual questions. Yes, there are some famous people’s memorials here at the East Cemetery, George Eliot, Karl Marx and Douglas Adams to name three. But it’s the mysterious West Cemetery that’s the real secret place to see. It’s around 25 minutes tube travel from the Melita Hotel and you have to book a tour in advance, but it will be a tour you won’t forget. 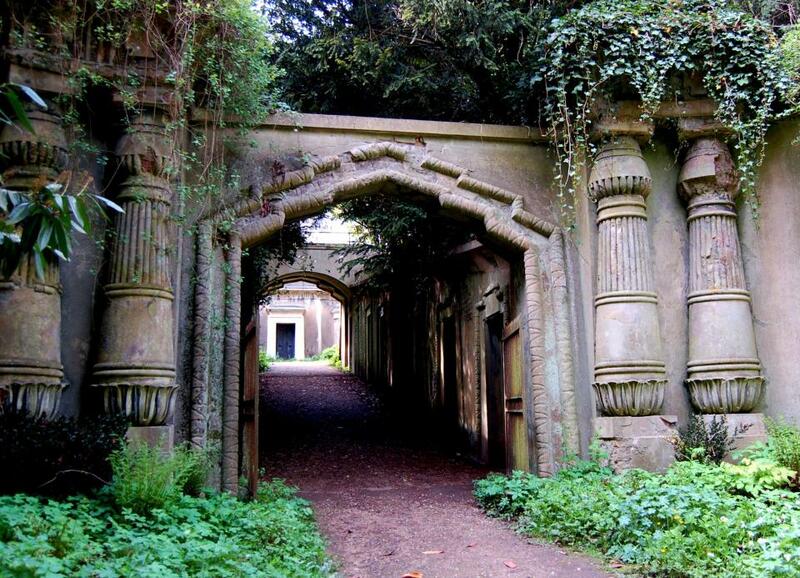 First opened in 1839, the cemetery is hidden by thick foliage, keeping it well hidden from London’s prying eyes. The cemetery is a secret garden, made up of eery catacombs and vast gothic tombs. The architecture in the Victorian Pharaonic tombs and mausoleums is a must see and the entire place is a Grade I listed national treasure. Keep on your toes here however, there is a rumoured occult past to the place, and it is the site of the notorious Highgate Vampire. Best get back to the Melita Hotel before midnight. A little touch of Italy in London, kind of. The reference to the famous Italian city is a nod to the beautiful waterways and boats, as opposed to any other kind of Latin similarity. Situated just to the north of Paddington, the Regent’s Canal and the Grand Union Canal meet and create a positively picturesque corner of the capital. Unique waterside restaurants, pubs and cafes are in abundance. Boat trips on the canal are also available, some of which can take you from Little Venice to Camden Lock Market in less than an hour. Not the quickest way to get there, but so much more relaxing than another journey on the tube, especially in summer, phew! If summer is the time of your visit then you’ll find plenty more going on in and around Little Venice. There’s a puppet theatre on a barge as well as an amphitheatre which puts on events throughout the year. If you are a fan of sport then the spiritual home of cricket, Lords, is just a little further up the canal. If you are visiting from abroad please note, do not try to understand the rules of cricket before your visit, just roll up to a game and enjoy the atmosphere! You’ll not find many London guidebooks encouraging you to venture south of the river. When viewed from the London Eye the South looks like a flat desolate place whereas the North looks like a place of tall buildings, flashy lights and historic wonderment. But secret gems are often where you’d least expect them. 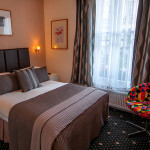 Victoria station is a few minutes walk from the Melita Hotel, but this time we are not going on the tube. South London is obviously too inhospitable and deserted to have a tube line running to it (you may hear some Londoners grumble in a sarcastic tone). Instead we’re going to jump on a good old fashioned British Overground train and stay on it until we reach the handily named Crystal Palace station. As the name suggests, Crystal Palace Park was the resting place of the famous Crystal Palace, after it was moved from Hyde Park after the Great Exhibition. Unfortunately, the great building burnt down in 1936 but the name and the park remained. As well as the remains of the Crystal Palace itself, the park also boasts a cafe, children’s play area, a maze, a fishing lake, a concert bowl. However, what sets Crystal Palace Park apart from other parks in the capital, is it houses the remains of a Victorian theme park. 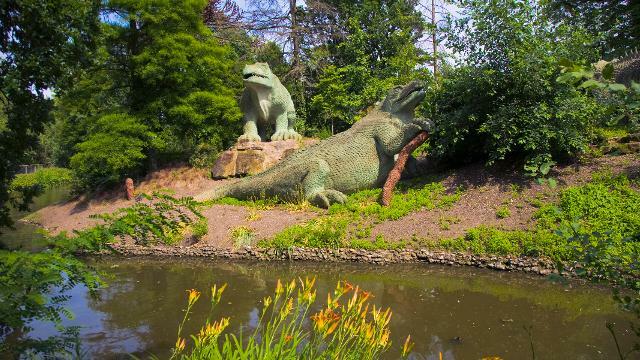 A dinosaur theme park, the Victorian equivalent of Jurassic Park. The dinosaur models are local icons and were put there by the founder of the Natural History Museum. They’ve been enjoyed for over a hundred years and what gives them added modern interest is that they are so spectacularly wrong! The scientists of the day unfortunately put a fair amount of dinosaur bones in completely the wrong order which means these models look nothing like the dinosaurs they are based on, something that makes them very unique! Fortunately, modern day plaques have been erected to show you how the dinosaurs should have looked. 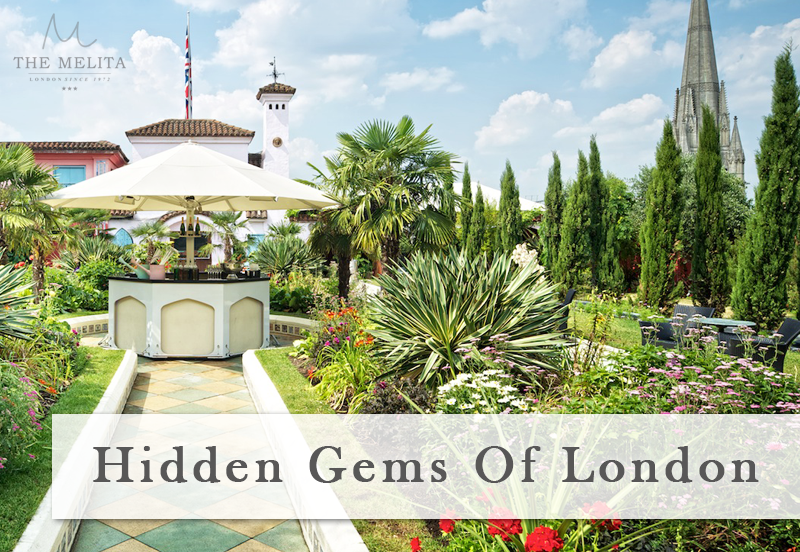 These are just a few examples of the many secrets London hides within its sprawling borders. There are many more to find and we don’t want to reveal them all at once! 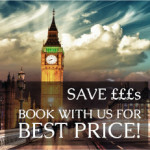 Whatever the reason for your visit to London, setting up base at the Melita Hotel puts you in the perfect position to thoroughly explore everything it has to offer.